If your garage door has stopped working and refuses to open or close, you may have a broken spring on your hands. This is one of the most common repairs we are tasked with fixing for local customers but it can also prove to be one of the most dangerous. 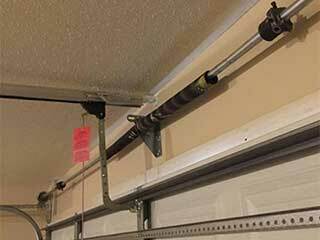 Many overhead garage doors are designed to incorporate an extension spring and some will feature torsion springs. The idea of the spring is to hold the door still when it is left part way open, stopping the door from opening or closing too quickly and making the mechanism safer and easier to use. You can test the condition of your spring by opening your door halfway and releasing it. If the door stays still or moves very slowly in either direction, your spring is doing its job. If it moves quickly as soon as you release it and slams it is likely that your spring needs an adjustment or to be replaced. Our experts can repair and replace all types of garage door spring. Whether your door is new or old, our technicians know exactly which model to install for you. We can get your door working as good as new without risk to your person or property. It is never a good idea to attempt this type of repair on your own. Aside from the possibility of using the wrong replacement spring for your needs, you could seriously injure yourself in the process. Garage door springs are designed to hold a great deal of force in their coils. If this pressure is released by using the wrong installation or removal method, the device can be extremely hazardous. Don't take the risk! Get in touch with our team today at Garage Door Repair Miami to arrange a visit from one of our experienced technicians!